Stories are at the heart of everything senior Skylar Rispens does. And, she does it all. Photo. Web editing and design. Writing. Social media. You name it, she does it well. Skylar says according to her parents, she’s been passionate about telling stories even before she could talk. She graduated from Helena High School and set out to study journalism at UM. She says she shaped her course work to dig into photography and writing. But, she’s also been the multimedia producer for the Montana Native News Project and during her trip to Korea this last spring with Montana Journalism Abroad, she was the web content editor as well as a photographer. Sklyar in South Korea on the Montana Journalism abroad trip this spring. Skylar worked as a photographer and the web editor. Click on the image to see the site she managed. Photo by J-School student J.K. Lou. Nicole Gone looks out her kitchen window to her backyard where she hopes to have a raised bed garden of her own. Gone regularly attends community gardening events in Hays, Montana hosted by MSU Extension Agent Hillary Maxwell. Photo by Skylar Rispens. For the Native News project in 2018, Skylar covered food security on the Fort Belknap reservation with her teammate Mari Hall. Click the image to see the full story. This fall, she’s the photo editor of the new iteration of the Montana Journalism Review project. This summer, she spent 10 weeks as an intern in Butte, reporting for the Montana Standard. There, she covered stories like the annual Montana Folk Festival to following an infrastructure bond proposal from committee to school board approval. Her favorite assignment at the Standard was a world-class mountain bike race. She not only reported on the race, but documented it with incredible photo work too. Skylar’s story in the Montana Standard, “Butte draws from Bozeman, Helena models to boost mountain biking growth,” looked at the burgeoning mountain biking scene in southwest Montana. Click the image to see the full story. Skylar covered the 11th annual Montana Folk Festival in Butte for the Montana Standard. Click on the images to see the full gallery from the festival. 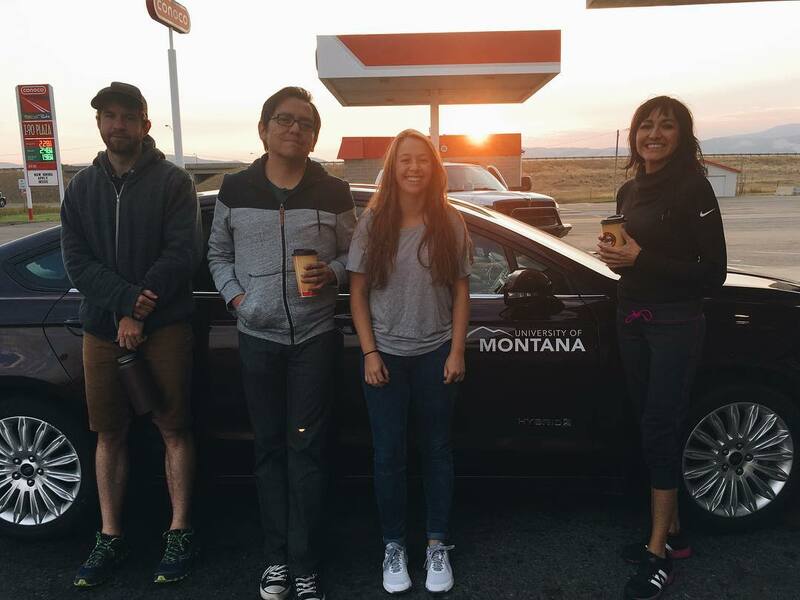 Montana Journalism Review (MJR) students and J-School Professor Jason Begay on the road to Standing Rock. Following a five-day trip to the Standing Rock Sioux Reservation, a team of journalism students and a professor have been at the center of a lot of media attention, a sign that coverage of the intertribal stand against the Dakota Access Pipeline is both sorely lacking but also highly sought after. During Labor Day weekend, Associate Professor Jason Begay and three students—grad students Matt Roberts and Lailani Upham, and undergrad senior Olivia Vanni—drove to the North Dakota campsite where an estimated 250 tribes have gathered to stand against a massive oil pipeline project. The students were reporting for the Montana Journalism Review (MJR) and were looking to research how the media was covering the Standing Rock camp. Standing Rock Sioux tribal members have been camping at the site since May, as they challenge the construction of the Dakota Access Pipeline, which would pump nearly 1,200 barrels of oil from the Eastern North Dakota to Illinois. Although the pipeline wouldn’t go into tribal lands, it would cross the Missouri River just upstream from the Standing Rock reservation, including through an area sacred to the tribe. The campsite has been billed as a non-violent demonstration by participants, but during the MJR reporting trip, violence rocked the area as tribal supporters and pipeline employees and security guards clashed over the construction site. Media attention increased exponentially for both the campsite and the reporting team. Before the team left North Dakota, they were interviewed for stories by both a Missoula TV and radio station. Begay was invited to write a story for the Butte Standard. Other programs that featured interviews and photos from the team include Public Radio International, Native America Calling and the Navajo Times. Begay was also invited to talk about the trip on two panels at the Excellence in Journalism conference in New Orleans in mid-September. of the trip in its 2016 edition, due out later this year. J-school students divide into teams and travel to visit different reservations across the state. Photo by Courtney Gerard. After weeks of planning and preparation, UM journalism students in the class Native News are spending spring break reporting on their stories. The students work in teams of two that pair photojournalists with print reporters to create a complete multimedia story. With the upcoming presidential election in November, Native News professors Jeremy Lurgio and Jason Begay decided this year’s project should focus on politics. “The President has a lot of influence over Indian country,” Begay said. “Voting on reservations tends to be less bipartisan, especially when it comes to internal politics,” Lurgio said. However, the reporting teams have chosen stories that dig into the specific political issues that impact their designated reservations, instead of covering the national influence. The students reporting on the Crow Reservation recently followed tribal leader Darrin Old Coyote to the 2016 Montana Energy Convention in Billings to hear him speak about how coal affected jobs on his reservation. On Fort Belknap, Sophie Tsairis and Lenny Peppers are investigating access to voting and the satellite voting offices on the reservation. Tsairis has been posting reporting updates from Fort Belknap on Instagram. On the Blackfeet Reservation, Courtney Gerard and Peter Friesen are digging into constitution reform. However, their trip also aligns with the arrival of 88 bison from Elk Island in Canada returning to the reservation, as part of a cultural and ecological relocation effort. 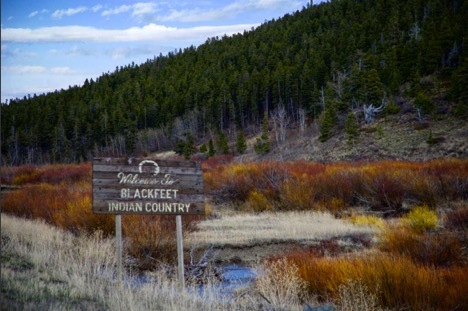 To see live updates from the Blackfeet, follow Gerard’s posts on Instagram. When the students return from the reservations, the pairs will start synthesizing their individual stories into a collaborative, multimedia piece. The final projects from each team will appear on the Native News website in May and circulate the state in the annual print edition. 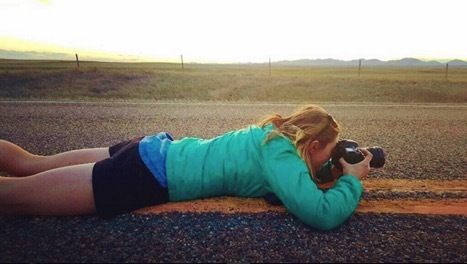 Native News photographer Sophie Tsairis tries to find the best angle to capture a spectacular landscape to illustrate her story. Photo by Lenny Peppers . To catch the latest updates from the Native News reporting teams, follow their accounts on Facebook, Instagram and Twitter.